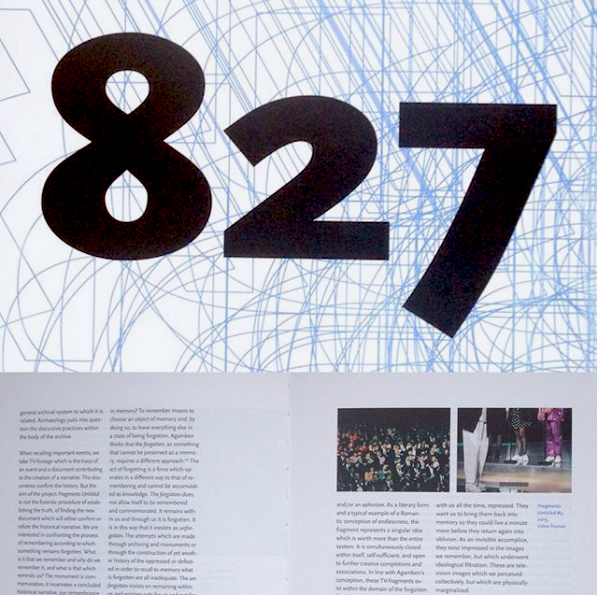 Resolution 827 is the outcome of collaboration between Stedelijk Museum Bureau Amsterdam and the Museum of Contemporary Art, Belgrade. The title of the exhibition, Resolution 827, refers to the UN resolution that was adopted in 1993 and established the International Criminal Tribunal for the former Yugoslavia (ICTY). The point of departure for the exhibition was to find a common denominator in the analysis of the societies of Serbia and other republics of the former Yugoslavia as well as the Netherlands, and to open up the debate on shared sore points, like the genocide in Srebrenica that was subject to ICTY investigation. The artists involved in this exhibition scrutinize questions of responsibility in each of the societies in question, but their contributions also revolve around the way in which we can relate to the atrocities through the procession of the visual and audio files collected from ICTY and other archives. These artistic proposals point to a lack of public debate on questions of the utmost importance to our societies, such as the resolution of policies of aggression and ethnic cleansing in the case of the former Yugoslavia, and policies of deterrence by presence in the case of the Netherlands. By exposing how these taboo topics, which appear to be locally grounded in each of the societies in question, resonate in one another, we can reflect upon the universalizing potential of social and political taboos.